I’ve made, or more like tried to make, these elusive awsome French (well actually they are of Viennese origin) a few times over the past 3 years. Never have been blown away with a recipe. The first one truth be told was downright horrible, with pools of grease that the poor little breads more or less fried in. That recipe was from an online source, although I blame my craftsmanship for that failure, not the recipe. The previous couple of times I used Jacques Pepin’s recipe from his book, the great “The Complete Technique”. These were much better, but they were still to doughy, too bread-like and not near as flaky as I would like. This all changed last week when I procured a used copy of Nick Malgieri’s “How to Bake”. I bought it mainly because I’ve made his fabulous Dacquaise cake and because it had several recipes for croissants and danishes. 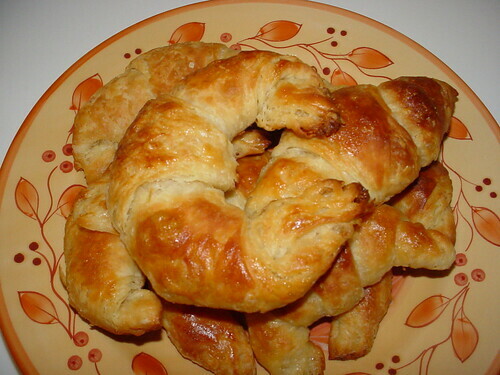 What a remarkable imrpovement that croissant recipe had on my result. The croissants were near perfect, flaky, buttery and not in the slightest greasy. With improved technique (read: practice) I think my croissants will rival those of any bakery. Well, at least the ones in Houston.